Keynote 6, part of Apple's new iWork family, has made the leap forward to 2013. It's a complete rewrite of Keynote '09 and now has file compatibility with the iOS version. Here's my review. 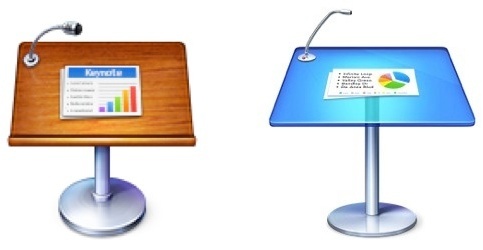 Keynote is Apple's counterpart to Microsoft's PowerPoint presentation application. Keynote has always been considered easier and more fun to use, yet can create very professional looking presentations. Best of all, Keynote can import, edit, and export PowerPoint files. Keynote 6 for OS X, along with its siblings, Pages and Numbers, is free and available several ways. If you buy a new Mac or iOS device, all the iWork apps are free. If you already own iWork '09 or bought the iOS versions and have upgraded to Mavericks, all three are free. You'll download it from the Mac App Store, in the Menu Bar: Apple > App Store... Mavericks users are already seeing it in the Updates tab. 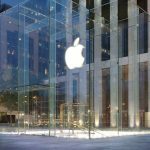 For more information, see the article by our Chuck La Tournous, "Looking for Those ‘Free’ iWork and iLife apps? Start Here." Keynote 5.3 for OS X, while a solid app, is getting old. It doesn't have the finesse and features of Keynote 6. Keynote 6 can import and export Keynote 5.3 files, so there's no loss in access to your older 5.3 documents. Keynote 6 allows you to create a document on the Mac, sync it to iCloud, download it on an iPad and continue editing there. And it's free. When you install any of the new iWork apps, like Keynote, a new folder will be created in your /Applications folder called "iWork '09" and the old version will be placed there. 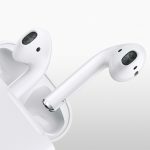 It's not likely you'll need it again, but Apple has thoughtfully arranged for it to be saved -- just in case, I surmise, the new version 6.0 has conversion glitches. Apple states that there are three important design elements at work in this new version. Powerful tools and dazzling effects. Work effortlessly with MS PowerPoint. The most important thing to know about Keynote 6 (and its siblings) is that it is a port of the iOS 6 source code. That means the old '09 code was thrown away and the iOS code was modified in order to achieve 1) File compatibility and 2) Similarity of operation. That is, similar within the bounds of the iPad's gestures and the Mac's mouse actions. From the opening splash screen. Presentation apps are always adding new themes, new effects, and new features, so I won't dwell on those, but the most important thing to know about version 6 is that you can reliably import and edit files created in iOS with no conversion issues. It gave me pause to see the item under Sharing about PowerPoint compatibility as if it were a new feature. Version 5.3 had that, and I've used it before. I didn't have time to investigate what improvements, if any, were made in the ability of version 6 to import PowerPoint slides with advanced operations. 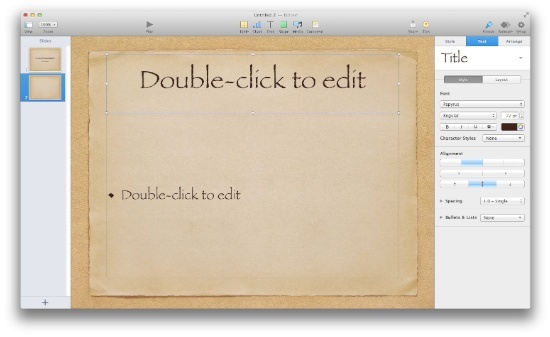 In the past, for classes I've been teaching, I found it convenient to prepare my slides on my Mac in Keynote 5.3. Then I would use iTunes to move the presentation to my iPad. (I use a 30-pin to VGA cable to plug into the classroom presentation system.) I kept my slides simple in order to avoid conversion problems. 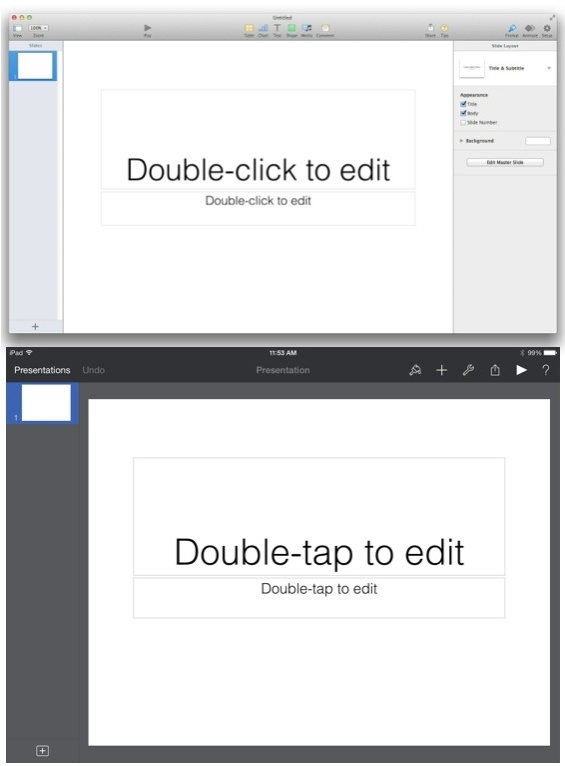 Top: Mac Version; Bottom: iPad version. Very similar looks. Now, I think I'll just use Keynote 6, sync to iCloud, and then grab it on the iPad. The iTunes transfer mechanism is and always has been extremely obtuse. Another new feature is called shared links. If you set your document up to reside in iCloud, you can generate a URL that can be shared in traditional ways: email, Facebook, Twitter etc. You'll use the "Share" icon in the toolbar. Colleagues on PCs and Macs can then see and edit the document in their browser. Best of all, collaborators don't need an iCloud account to view and edit your presentation. 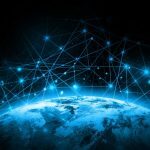 There is one problem with the current implementation, and that's described by Ryan Faas in "Apple's new iWork apps are great, but iCloud sharing has some serious flaws." 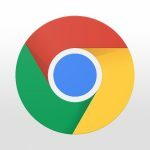 The problem is that anyone who comes into possession of the URL can edit your document, and there's no way to prevent it. 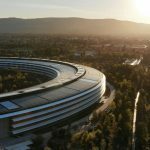 Apple tends to roll out new features that are cool and elegant, but then business professionals find that some features violate their policies on control and security. Everyone complains. Eventually, with enough usage, feedback and pressure from professionals, Apple adds the enterprise level (or acceptable) functionality. For a long time, the Apple community was annoyed that the iWork apps weren't being regularly updated. Now we know what was happening. According to sources in a position to know, a decision was made to have a common code base between iOS and OS X. That meant using the iOS source code to create the OS X version. Part and parcel of that is file compatibility. However, the work took some time and faced various challenges as OS X evolved. Along these lines, one of the things I wondered about was fonts. When I placed my iPad next to the Mac and looked at available fonts, I saw that there was a font on the iPad that did not appear on the Mac version: "Al Nile." So I created a presentation in Al Nile on the iPad and mailed it to the Mac. A ZIP file was created, and I think that's a clue. When I opened the presentation in Mavericks, that font became avaialble. From this quick test, it appears that Apple tacked the problem of "missing fonts" in the process of moving presentations from device to device. And, of course, the file can be tagged in Mavericks. Apple has online documentation for Keynote that is well organized and allows you to see the outline at a glance, then drill down to specifics for a feature. It's avaiable in many languages. The instructions are very well written. At the end of every page is the annotation, "Was this help page useful? Send feedback," with a link. It's a geat way for users to provide corrections. All in all, it's excellent documentation. There is also a Keynote support page. One of the things that bugged me about version 5 was the detachable Inspector. It was never where I wanted it, and it always took just a minute to inspect it, digest it, and figure out how to find and use the right function. In version 6, great strides in ease of use have been made by having the Format Inspector be context sensitive. It changes so that only operations associated with the object being edited appear. Plus, it stays right next to the composition pane, so you always know where to look, saving time. This is great, I love it, and it's a major reason to upgrade to this new version. If you're working on the title, only the applicable controls appear. Another nice usability feature is the Tool Bar button called "Tips." Click it, and you get small yellow boxes on the display that explain the operation of the various controls. This is terrific. Every app should have a feature like this, not just those from Apple. One thing I don't like is the way one adds a new slide. Instead of the traditional, obvious button at the top of the slide list called "New," there's an abstract "+" button at the bottom, perhaps out of sight. Of course, there's the menu option Slide > New Slide, but the point is visual recognition. One might not be sure, at first, what the abstract, lone "+" does, but a button labelled "New" is pretty darn clear. I've been teaching classes for years, and I always use Keynote to prepare my class slides. 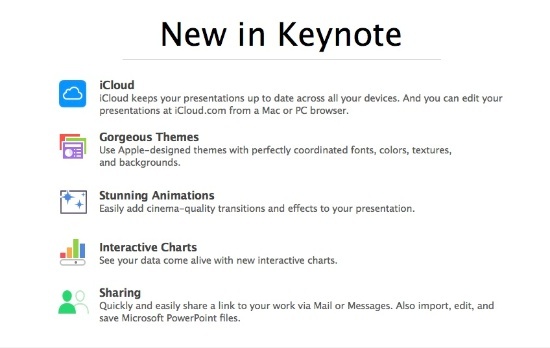 Keynote '09 was pretty good, but the new features of Keynote 6, file compatibility, font compatibility (it appears), iCloud syncing, collaboration features, some new, very nice looking themes and effects and greater ease of use means that this is an essential upgrade. File compatibility with iOS version, new themes, effects and animations, easier to use, built-in tips, iCloud syncing between iOS and OS X, collaboration via iCloud, compatibility with Microsoft PowerPoint, great export options. The app is free. Presentations shared via URL on Web are not password protected.